Toronto to Terni: Warm fuzzies. Earlier this week, I received my first "care package". It's always nice to know that no matter where I am, I have my amazing Toronto girls who love me. 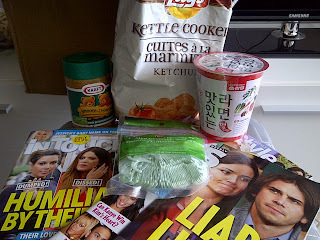 It's funny how simple things like peanut butter, ketchup chips, Korean cup noodles, floss picks and gossip mags can put a great big smile on my face. Awwww how sweet! Hope you are doing well! Sounds like you are doing well! Any plans for a vacay to the dirty south this summer??? :) would love to finally meet!